This month was a busy one for building design. A two-day workshop with the architects, engineers, building committee and staff was held to discuss systems for managing temperature and humidity (a very important consideration for collections care and conservation), lighting, flooring, ceiling forms and dozens of other structural and functional considerations. 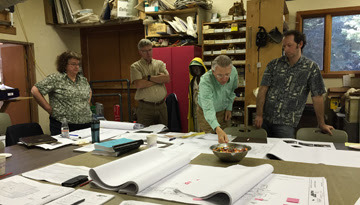 Work on design details will continue through the fall, and the capital campaign continues with staff and committee members meeting with prospective major donors and foundation funders. Just in: Updated Renderings of the Building Exterior, Floor Plan, and Site! Over the past few months, Pratt project architects, engineers and staff have been developing the new building design and site plan. One change to the previous schematic design includes the location of air handling systems, creating a new roof line. Tweaks have also been made to remove the need for pillars in the main gallery and gain more overhead space for the gray whale. To better account for existing slopes and handicapped access, the Phase 1 Site Plan has been modified. Design Development will be completed in early August, and construction drawings will be completed in the fall. We will be shovel-ready by the end of the year! Substantive planning work on aquaria and exhibit design is in the works and we’ll have some exciting drawings to show off very soon! Exhibit design will continue through 2016. Fundraising also continues. We expect the State’s budget situation will delay the construction timeline. We are working on other sources of funding in lieu of the remaining piece of the State appropriation that was originally requested. At the Museums Alaska annual conference in Haines last month, the Pratt Museum was honored as the recipient of the association’s Excellence in the Museum Profession Award for the Gray Whale Project. This is the only exhibit or project award given by the association, and recognizes the Pratt once again as a leader among the state’s 80-plus museum institutions. “More than just an exemplary exhibit, the Pratt Museum’s Encounters: Whales in Our Waterssurpassed the level of public involvement and investment normally considered possible in a community museum exhibition,” said Museums Alaska President Angela Linn. The exhibit project started 14 years ago, in 1999, when museum volunteers collected the carcass of a juvenile gray whale found in Kachemak Bay. Its bones were cleaned by volunteers, catalogued by visiting students, conserved, studied, and finally, during the summer of 2012, articulated under the guidance of local bone expert, Lee Post. In January 2013, the large components (backbone, tail section, skull, flippers), were transported by more volunteers, who carried them into the special exhibits gallery where the whale was suspended—whole again after 13 years. The only shortcoming to Encounters is that it was, in fact, too short. Although this exhibit lasted six months (longer than any recent exhibit at the Pratt) and caught the early summer visitors, many urged for it to stay in place indefinitely. Luckily, the gray whale’s role in community building is not done. In a couple of years, many of those volunteers are hoped to return to help move their 1773-pound whale once again. When the museum throws open the doors of a new building, the whale will be waiting, in a new permanent installation, to greet its many supporters.